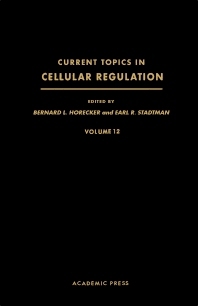 Current Topics in Cellular Regulation, Volume 12 focuses on the binding of polypeptide hormones to the specific receptor sites on the cellular membrane. This book consists of six chapters. Chapter 1 describes how several polypeptide regulators, hormones, and growth factors act through very similar mechanisms. The second messenger roles of cAMP and cGMP in the regulation of various protein kinases are dealt with in Chapter 2. Chapter 3 discusses the experimental conditions employed in studying the characteristics of regulatory enzymes in vitro and in vivo, while Chapter 4 elaborates the intracellular compartmentation of enzymes, cofactors, and metabolic intermediates of glycolysis in various tissues from different organisms. The biochemical mechanisms that underlie the induction of enzymes in catabolic pathways are considered in Chapter 5. The last chapter is devoted to the role of T4 phage-induced covalent modification reactions in the transcriptional control of DNA-dependent RNA-polymerase in E. coli. This volume is suitable for biologists and researchers concerned with the basic mechanisms involved in the regulation of diverse cellular activities.